Looking for an idyllic, relaxing, get-away from it all holiday? 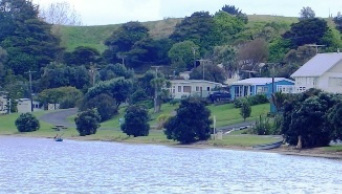 Absolute waterfront, only a short drive north of Auckland? The Bach is a typically classic (i.e. 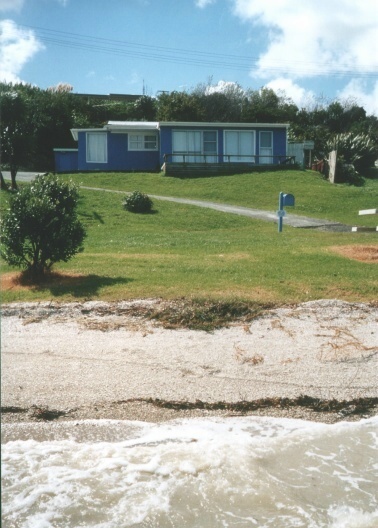 full of character and well-loved) kiwi holiday home with 4 sleeping areas and is elevated to catch the sun and awesome panoramic harbour views. Bedding consists of 1x Queen and 6x full size Singles (bunks), plus a roll-out Single and one fold-out Futon-style Sofa-bed (small double), and even a Bassinette. The bach will sleep 7 people, and can squeeze in a maximum of 10. The bach has a well equipped kitchen including 2x fridges, a big freezer, dishwasher and microwave. There's also TV, DVD player, a CD/Tape deck, washing machine and dryer, and heaters for winter. And in true kiwi style holiday home tradition - a big gas BBQ. In the garage you'll find plenty of outdoor fun gear too all included at no extra cost. Rental rates for the Holiday Bach start at $50 per night, with all holidays on a self-cleaning basis. Rates are seasonal, requiring a minimum stay of 2 nights (Fri & Sat for a weekend) with discounts if you stay for a while and allow up to a maximum of 10 occupants. As there is only one bathroom and nowhere to pitch a tent we do not accept larger groups. Duvets and pillows are provided but all linen (i.e. sheets and towels, etc) are BYO. No smoking is permitted inside the bach. More info on booking rates.